The Book Thief is the story of Death's recollection of Nazi Germany with World War II looming, Jews being taken away to concentration camps and the life of a certain young girl named Liesel Meminger as she meets her new foster parents, makes friendships, and grows mentally and emotionally. Throw in an accordion–playing foster papa with a promise from long ago, a young man who also happens to be a Jew, and a craving for books with stems back to death and a snowy grave, and you have the story of a book thief. Wow! This was......... *gulps and dabs puffy eyes* And it was sooooo dense and hugee! It took forever to finish without succumbing to the temptation for reading ahead.........*groans* It's a real timeless masterpiece tho. And it was sad to read about the jews :'( Even tho I already know the stories of what happened to jews in Nazi Germany, every time I hear/read about it, it still manages to make my stomach churn for the injustices that occurred. “At times, in that basement, she woke up tasting the sound of the accordion in her ears. She could feel the sweet burn of champagne on her tongue. Sometimes she sat against the wall, longing for the warm finger of paint to wander just once more down the side of her nose, or to watch the sandpaper texture of her papa’s hands. If only she could be so oblivious again, to feel such love without knowing it, mistaking it for laughter and bread with only the scent of jam spread out on top of it. Hans: I loved Hans <3 He was clearly a kind man from the get-go. And you continue to see affirmations of this all through the book. But sometimes his kindness gets the best of him, and he's haunted by his decisions. You can't help feeling sorry for him, because, of all things, kindness could hurt him. Max: Is a jew. And what was sad was that the damnation and shunning of the jews really took a toll on them, Max included. He felt extreme guilt for surviving as long as he did where his family did not. He felt extreme guilt for feeling relieved to be alive. And he felt extreme guilt for letting other's risk their own lives to help him. Which, frankly, is really sad and disturbing. It wasn't the jews' fault that they were being hunted, tortured and killed. And yet the ones that survived felt the burden of guilt. I think that the moral of the story was to point out, just as Death pointed out, the relationship between the monstrous heartache and the sharp beauty that live within the same moment. 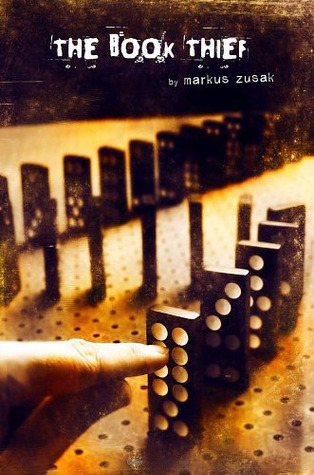 “All I was able to do was turn to Liesel Meminger and tell her the only truth I truly know. I said it to the book thief and I say it now to you.